CANASTOTA, NY - JANUARY 17, 2018 - Two-time Olympic gold medalist and reigning WBC / IBF women’s super middleweight world champion Claressa “T-Rex” Shields successfully defended her titles against Tori Nelson at Turning Stone Resort Casino in Verona, NY on January 12th. 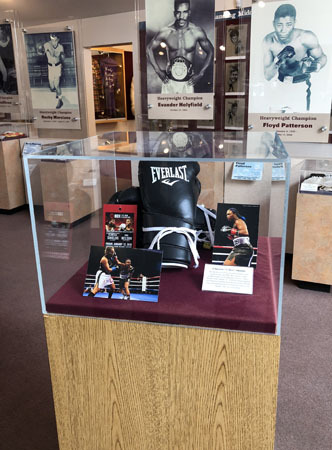 Following the bout, Shields donated her fight-worn boxing gloves to the International Boxing Hall of Fame. “It is an incredible honor to have my gloves on display at the International Boxing Hall of Fame where the greatest in the sport’s history have been honored. 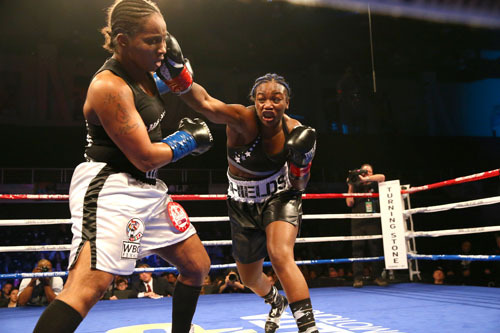 As a two-time US Olympian, a unified world champion boxer, and a professional athlete representing all women in sports, I’m thrilled and humbled that fans the world over will be able to see my gloves when they visit Canastota,” said Shields. Born in Flint, Michigan in 1995, Shields began boxing at age 11 after hearing her father speak about boxing champion Laila Ali. At age 16 she won the Olympic Trials and headed to London to represent the USA as a middleweight in the first Olympic Games to showcase female boxing. At age 17 she made history by winning three bouts to become the first American female boxer to win a gold medal. Four years later she made history again, capturing the Olympic middleweight gold medal for a second time and becoming the only American to capture gold twice. Her amateur record was an incredible 77-1 (18 KOs). “T-Rex” turned pro in 2016 and captured the WBC and IBF super middleweight belts in 2017. Following the Nelson bout, her pro record now stands at 5-0 (2 KOs). 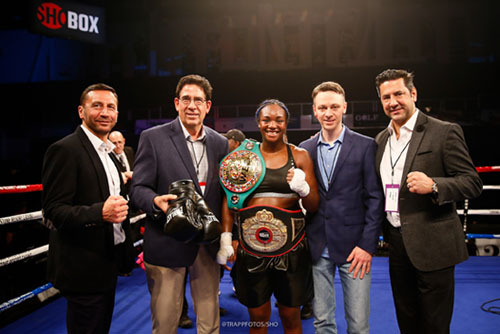 The Shields vs. Nelson bout headlined a full card of exciting boxing action at Turning Stone Resort Casino in Verona, NY presented by Salita Promotions in association with AASHA Record Breakers Inc. and televised live on ShoBox: The New Generation. For more information on the Hall of Fame, please call the Hall of Fame at (315) 697-7095, like the Hall on Facebook and follow on Twitter.